Deep Geeking: This episode, Neil and Edmund join Tim, Summer and Jeremy to talk about the 3 short stories from the Amazing Stories magazines: “Shadow of His Thoughts”, “Genius Loci”, and “Space, Time and the Incurable Romantic”, all three of which were written by J. Michael Straczynski. The conversations then shift to the 3 short stories that appeared in the Official Babylon 5 Magazine, “Hidden Agendas” written by JMS, “True Seeker” by Fiona Avery, and “The Nautilus Coil” by J. Gregory Keyes. Deep Geeking: This week, Tim, Jeremy and Agent 6 go in-depth discussing The Psi Corps trilogy, written by J. Gregory Keyes. 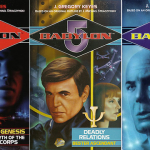 The books in the series are “Dark Genesis: The Birth of the Psi Corps”, “Deadly Relations: Bester Ascendant” and “Final Reckoning: The Fate of Bester”. This trilogy tells the story of the sudden appearance of human telepaths on Earth, and political and societal events leading up to the creation of Psi Corps, then the story arc telling the rise of Alfred Bester through the Corps, and what happened to both in the aftermath of the Telepath War. Deep Geeking: Legions of Fire, The Centauri Prime trilogy written by Peter David, is the topic for this episode, and the crew on hand really digs in. The books in order are “The Long Night of Centauri Prime”, “Armies of Light and Dark”, and “Out of the Darkness” (the third book is out of print, but not quite as hard to find as it had been in previous years). This was the second of the Babylon 5 trilogies that are considered canon. Tim feels this is the weakest of the trilogies, while Joe feels it’s stronger than most people give it credit for, and one of the strongest franchise series he’s ever read. Discuss amongst yourselves! Nigel Blackwood, intrepid reporter for Multiverse News (also featured on Slice of SciFi), has a knack for digging up interesting candid photographs, revealing secret scifi histories that we previously had no knowledge of. We lament the passing of science fiction master Harry Harrison, recounting some of the classics that he’d written over the years. 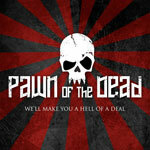 So, some of you may have wondered how a promo for a horror parody webseries ended up playing in an episode of The Babylon Podcast. Well, the short answer is: Vorlons asked me to. Deep Geeking: The Shadow Within is Book #7 in the original series of novels, and the other of the two from that series that have been acknowledged as canon. Talk about this book delves deeply into Anna’s story, and into the character and motivations of Morden, of the Psi Corps mission to eliminate a threat to the telepaths, and how these events mesh into the main Babylon 5 storyline as a whole. Deep Geeking: To Dream in the City of Sorrows is Book #9 in the original series of novels, and one of the two from that series that have been acknowledged as canon. Talk about the book ranges from the cover art, the story arcs for Sinclair, Marcus, Catherine and Neroon, the accuracy of the character “voices”, the nagging feeling that this book’s pacing was too fast, and very likely could have been a much better book if it had been allowed to be longer, and more. And go watch H+ the Digital Series; Summer is impressed and doesn’t think you’ll be disappointed. It’s the first web series she’s seen since Dr Horrible that she’s planning on buying on DVD even before knowing if one will ever be available. 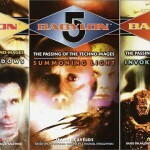 Deep Geeking: Discussions begin with the Babylon 5 novels… the books, the books, the books! Where to begin with the commentary and the criticism? 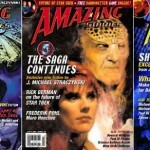 Much of the dissatisfaction that we feel with these books likely comes from a combination of the main characters authentic voices being slightly off, plus the impression that the events of the books didn’t matter, that they fell into the trap of hitting the “reset” button after the end of the “episode”, which is one of the things that we loved about Babylon 5 that the various Star Trek series couldn’t adhere to most of the time. 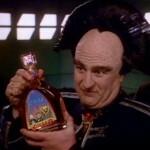 Every week is typically very good for Babylon 5 related sayings and arguments on Twitter. Today, I saw one, from an old friend no less, that had me laughing for hours. Thus, I share. 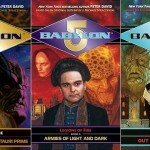 Deep Geeking: And so it begins… the last leg of the Babylon Podcast journey starts with us talking about one of the rarest books in the Babylon 5 realm, and a very interesting collection of thoughts, opinions and examinations about the the show we all love. Who knew that “Fasten, Zip” was really a metaphor for the paradox of time travel? We also talk about how many essays that were presented at the conference that weren’t published in this collection, and Summer’s new obsession quite well be to contact the academics who wrote those and find out if it’s possible to get those papers online.